It seems like bands playing music similar to Life On The Sideline are coming to fruition on an almost daily basis, attempting to strike a chord with fans of older emo-infused punk bands like The Early November. Not that that’s a bad thing, but in a scene that’s becoming increasingly congested it takes a really great record to leave a mark and bridge the gap, giving a modern spin on a formula tried and true. Thankfully, Life On The Sideline nail it, and their debut full-length Honesty Is A Dying Breed is a solid blend of then and now, fusing elements of say, Sunny Day Real Estate and newer bands like Grandview, making for a record which is generally pretty damn excellent. Life On The Sideline are the most recent signings to American label Take This To Heart Records, and when I reviewed Traditions’ Cycles EP a few months back I started it in a similar fashion, by commenting on the genre congestion and how the labels newest signing back then had set themselves apart brilliantly. That’s very much the case with Life On The Sideline, a band who don’t necessarily try anything new but do what they do sublimely. Honesty Is A Dying Breed is a record crafted with a deft eye to detail and a love for the artists that preceded and influenced it, and it’s a record with its heart on its sleeve, taking influence from the past whilst casting eyes towards the future, despite the nostalgia that laces it. It’s also personally penned, with vocalist Nick DiCiancia writing how he sees fit, never taking the easy option and instead letting his lyrics express himself, making for an honest listen that doesn’t hold back, with the other members of the band each contributing some of themselves in the process. As a result, Honest Is A Dying Breed sounds much larger than it initially does, opening up a little more with each listen. The record begins with Wake Up, a track very reminiscent of Bag Of Bones, drifting along on hazy guitar melodies as vocals saunter, before diving into Everything I Lost, which is much more up-tempo. The second track is one of the records best songs, featuring themes of escapism with a chorus that aches for change as instrumentals crash and spark before dropping off to a solitary acoustic guitar, only to bounce back twice as spirited. Each track is well constructed, and the songwriting on show is very commendable for a debut record. There’s experimentation in the shorter breakdowns of sorts on the emphatic Honesty Is A Dying Breed, whilst Drive showcases some very cool instrumentals and the records best drumming courtesy of Kagan Trombley, who at times maybe puts too much of an emphasis on cascading cymbals. This slight issue aside, the instrumental side of the record is particularly solid, mixing a number of styles and moods effortlessly, providing some variety in both the heavier and softer moments. Three members of Life On The Sideline contribute vocally, and the differing styles complement brilliantly, most noticeably during the chorus of eighth track I’d Be Nothing as melodic vocals clash with a harsher delivery, with both rising regardless. This track was one of my personally favourites, partly because it offers a more positive appeal in the final few minutes as the lines ‘I grew up hating each year and busting up the walls, wearing out my knuckles’ gives way to a grateful building elation that differs from the rest of the record. Life On The Sideline know how to write a catchy, relatable song brimming with energy, and there’s a life to the tracks featured on their debut that benefits them immensely, this one included. Following it with closer Rough Draft sees Honesty Is A Dying Breed end with its two strongest selections, as the tone that ended the preceding song carries over, as DiCiancia uses playing music as an outlet and means of escape to detract from life’s troubles as ‘You made me feel like an outpatient, the way that I drift from bed to bed / You made me feel like a nervous wreck, now I’m the artist and you’re the rough draft’ rings out in emphatic fashion. It’s an optimistic closer to a record that spends a lot of its time lost in introspection, and it’s a fitting finale to a release that wants to break free and eventually does. However, things are hampered slightly by a few shorter tracks that only just pass the ninety second mark and end up as little more than filler. I’m A Wreck is standard emo through and through, whilst the acoustic and echoing Artless is decent enough, but doesn’t offer a whole lot. The latest Seahaven record did something similar in order to break things up, but considering that record was breezy in nature it worked well. On Honesty Is A Dying Breed it seems a little unnecessary, especially considering the record is shorter than your average to begin with, at nine tracks and twenty-six minutes in length. It’s a small criticism, and thankfully songs like the electric Drive are strong enough that it’s easy to forgive following it with Artless. 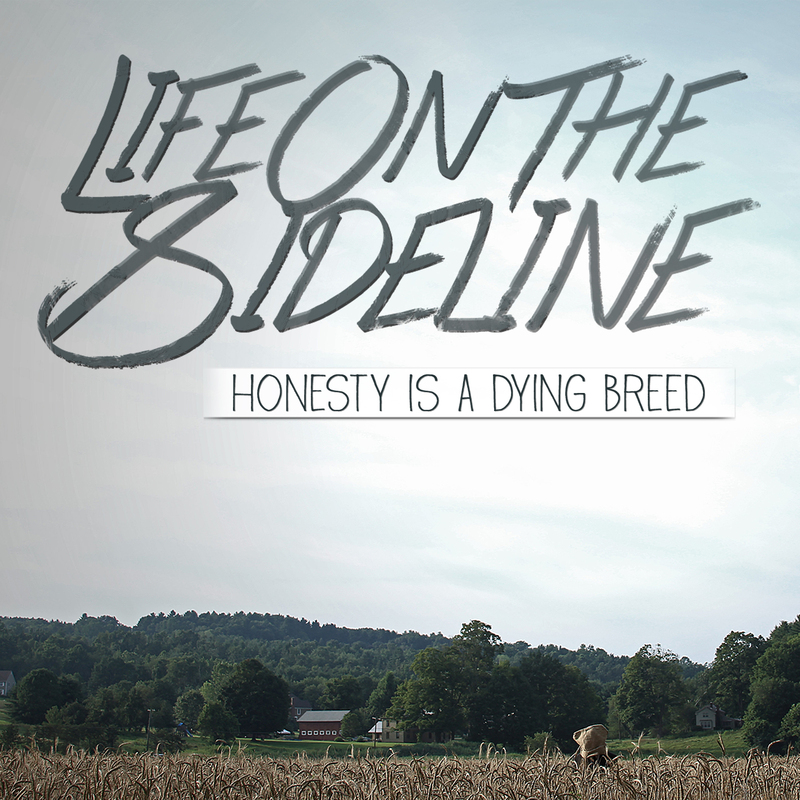 Life On The Sideline have released a great debut in Honesty Is A Dying Breed, inviting a listener in and taking them on a journey. It undoubtedly has its weaker moments, but for the most part it’s a great example of a band taking influences from elsewhere and implementing it into their own music seamlessly. There’s no reason why Life On The Sideline shouldn’t be up there with the likes of Citizen in the future, and if they can take what makes Honesty Is A Dying Breed so great and expand it further then the sky is the limit.